New 2019 NCBA Officers (from left) Jennifer Houston, Marty Smith, Jerry Bohn, Don Schiefelbein, Todd Wilkinson, Laurie Munns and Buck Wehrbein. 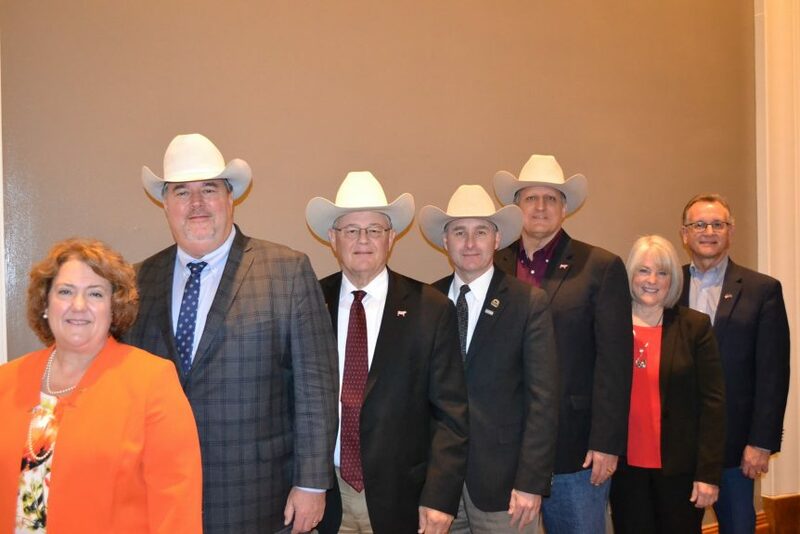 Elected to serve on the Beef Promotion Operating Committee from the Federation of State Beef Councils, joining Munns, Wehrbein and ten members elected from the Cattlemen’s Beef Promotion and Research Board, were: Katie Brenny (Minnesota), Gary Deering (South Dakota), Bradley Hastings (Texas), Chris Jeffcoat (Pennsylvania), Clark Price (North Dakota), Jeff Rudolph (Nebraska), Don Terry (Tennessee) and Vea Bea Thomas (South Dakota). CattleFax held its popular U.S. and Global Protein and Grain Outlook Seminar Thursday, Jan. 31. Sponsored by Purina Animal Nutrition, LLC and Zoetis, the session looked at the factors that drive the market, such as domestic and international supplies and demand. Dr. Art Douglas presented his outlook for 2019 U.S. and world weather at the session.